I really like the Anpanman brand! Who would have thought it could have taken off with such intense popularity? For those who dont know, Anpanman is a series of stories written by Takashi Yanase since 1968 with the lead character, also called Anpanman. Yanase became inspired by the idea of Anpanman while struggling to survive as a soldier in World War II. When he was faced with the prospect of starvation he said he dreamt about eating a bean-jam filled pastry called Anpan. Anpanman is heavily branded and merchandised in Japan. 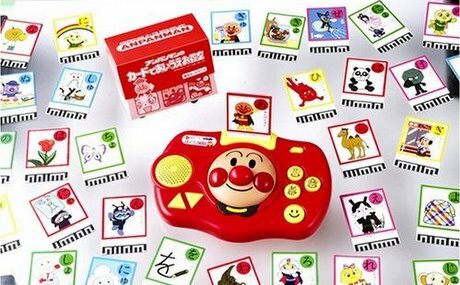 Anpanman characters appear on virtually every imaginable children’s product, from clothes to video games to toys to snack foods. They also appear on this brilliant educational tool to learn the alphabet!! I really like the look of this game because it looks like it is an electronic classroom. Has anyone tried this already with their students? I love Anpanman too! The game looks like a great way to teach my little girl some Japanese. So does this mean that it is available through Amazon and I wonder if they sell to Australia?